Chott El Hodna. 02/02/01; M’Sila, Batna; 362,000 ha; 3518’N 00440’E. Part of a series of chotts created by waters descending from the Atlas Tellien to the north and the Saharan Atlas to the south, typical landscape of vegetated Maghreb steppe with seasonal brackish and saline lakes, pools, and marshes and freshwater springs. The peripheral zone of chott, characterized by wadis and oases, surrounds the central zone of the sebkha, with a complete absence of vegetation. The site is important for a number of endangered species, notably gazelles, bustards, and marbled teal, and also qualifies for the List for its significance as habitat for indigenous fish species. Human uses include pastoralism and salt extraction, and the area is home to Roman ruins and other archaeological remains. Potential threats include pollution from urban and industrial waste water; over-exploitation of water, salt, sand, and soil; over-grazing and deforestation for firewood. Ramsar site no. 1053. Chott Merrouane et Oued Khrouf. 02/02/01; El Oued; 337,700 ha; 3355’N 00610’E. The chott is characterized by saline ponds and lakes that are permanent by virtue of the flow of the Wadi Khrouf, containing continuous runoff of excess irrigation for cultivation of palms and waste water from neighboring communes. Located in a region of arid steppe, the site is internationally important for passing migratory birds, some of which are classed by IUCN as vulnerable, as well as for several indigenous fish species. Other wetland types listed as present include freshwater springs/oases, irrigation channels, salt exploitation sites, and drainage canals. Human uses include livestock raising (principally sheep), salt extraction, and recreational hunting and fishing. Water pollution and over-grazing are seen as potential threats to the ecological character of the site. Ramsar site no. 1054. Complexe de zones humides de la plaine de Guerbes-Sanhadja. 02/02/01; Skikda, El Tarf; 42,100 ha; 3653’N 00716’E. Planned Regional Nature Park. A large coastal plain between the hills of Skikda and the forested massif of Chetaُbi near Cap de Fer, including the delta of the Wadi El Kىbir. Amongst the characteristic dunes can be found a multitude of depressions and valleys forming lakes and "garقas" (marshes) from a few to several dozen hectares in area, on a plain that is described as a "bioclimatic crossroads" including sub-Saharan and European as well as Mediterranean characteristics. In addition to its significant biological diversity, the site is important for migratory birds (especially as a nesting place for Oxyura leucocephala and Aythya nyroca) and fish and eels. Human uses include agriculture (especially tomatoes and melons) and grazing; potential threats include unmanaged agricultural expansion and runoff and waste-water from upstream villages. Ramsar site no. 1056. La Vallىe d’Iherir. 02/02/01; Illizi; 6,500 ha; 2524’N 00825’E. Parc National du Tassili; UNESCO World Heritage site. A high valley (1100m-1400m) in the center of a limestone Saharan plateau characterized by intermittent streams, lakes, and marshes, freshwater springs, and subterranean karst hydrological systems. The isolated nature of the site has led to remarkable evolutionary phenomena, described as "at the same time, a laboratory and a museum of the process of evolution", particularly for species which have been best able to resist the desertification of the area, such as lizards, serpents, and four species of fish. Basic palm and fig culture is practiced near the site by the Tuareg community on terraces above the valley floor, and some raising of vegetables takes place in areas shaded by trees. The rocky mountain walls bear rich pictorial evidence of some of the first human inhabitants of the Sahara; this has encouraged fairly significant tourism, which, however, was drastically diminished between 1992 and 2000 and is only recently beginning to recover. Ramsar site no. 1057. Lac des Oiseaux, ou Garaet et Touyour. 22/03/99; El Kala; 70 ha; 3647’N 00807’E. A shallow permanent freshwater lake in the northeast of the country that shrinks to about half its size in the dry season. The site supports a surprising diversity of vegetation (some 200 species), birds, and insects. Two globally threatened species, the white-headed duck (Oxyura leucocephala) and the ferruginous duck (Aythya nyroca) nest at the site, and the former has been counted at 164 individuals in January 1998, more than 2% of the world population. Approximately 8,000 people live nearby, and grazing of small numbers of livestock is practiced around the lake. Effects of population growth are seen as a potential threat. Ramsar site no. 975. Lac Oubeُra. 04/11/83; Et Tarf; 2,200 ha; 3650’N 00823’E. Added to the Montreux Record, 4 July 1990, removed from the Record, 18 November 1997. Within National Park. Extensive wetland complex, consisting of a freshwater lake linked to the Mediterranean Sea and a major dune system. Supports extensive plant life rare in Algeria, and abundant fish. Important for wintering waterbirds, some globally threatened species, and groundwater recharge. Human activities include water extraction for irrigation and domestic use. Surrounding area supports grazing and agriculture. Lac Tonga. 04/11/83; Et Tarf; 2,700 ha; 3651’N 00830’E. Added to the Montreux Record, 16 June 1993. Within National Park. Extensive wetland complex, including wooded hills, wet forest, and an important sand dune system. This seasonal freshwater lake is linked to the Mediterranean Sea and provides important habitat for extensive beds of aquatic plants and nesting sites for several rare and globally threatened waterbirds. Human activities include eel farming, livestock grazing, and seasonal cultivation. Management issues include regulating eel fishing and irrigation draw down, and restoring the lake’s natural hydrological functions. Designated a Montreux Record site in 1993 because the lake is covered by emergent aquatic plants, leaving little open water. There has been a significant decrease in the water supply to the lake, thus causing changes to its ecological character. Les Gueltates d’Issakarassene. 02/02/01; Tamanrasset; 35,100 ha; 2225’N 00545’E. Parc National de L’Ahaggar. A "guelta" is a wetland type specific to the mountains of Haggar and Tassili, a kind of rocky basin or "crater-hole" hollowed out of the riverbed. Either permanent or intermittent, gueltates are often found between 1,000 and 2,000 meters’ altitude, and their depth may vary between 4 and 15 meters. Permanent gueltates play a very important role in the lives of Tuareg nomads of the region and their livestock, as well as serving as stopover for migratory birds crossing the Sahara. Issakarassene, in the Haggar mountains, is a permanent wetland of a type that does not yet figure in the Ramsar classification system, fed both by permanent underground sources and sometimes by torrential rainstorms. The site supports a concentration of the last remaining examples of formerly thriving flora and fauna, of which several wetland-dependent species have been able to develop various forms of adaptation that have permitted them thus far to survive the gradual process of aridification of the Sahara, including fish species endemic to the desert – the cheetah Acinonyx jubatus and the gazelle Gazella dorcas are both classed as vulnerable by IUCN. The rocky, "lunar" landscape supports few human uses except as a source of water for nomads and their animals, and no significant threats are foreseen, except eventually a possible increase in tourism. Ramsar site no. 1058. Marais de la Macta. 02/02/01; Mascara, Mostaganem, Oran; 44,500 ha; 3541’N 00010’W. In a triangular depression separated from the Gulf of Arzew near Oran by a dune cordon, a complex of open water, marsh, and more or less humid steppe some nine miles inland, supplied by three permanent wadis. 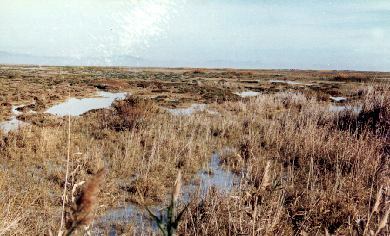 The site represents a wetland type that is rare in North Africa in the diversity of habitats it contains, most notably "sansouires" salt marshes that recall the Camargue in France. A large biodiversity is found there, including a great variety of halophilic vegetation, as well as numerous invertebrates and fish. The wetland is important for both local residents and nomads, particular during dry periods, for pasturage for their cattle and their sheep, respectively. Ramsar site no. 1059. Oasis de Ouled Saُd. 02/02/01; Adrar; 25,400 ha; 2924’N 00018’E. 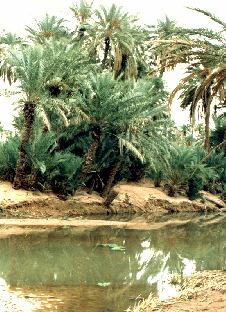 A rare human-made wetland created on the vestiges of a "fossil" wadi; over time, the diminution of the water in the wadi required the construction of a "fouggara", an ingenious system for the capture and distribution of groundwater. The water, distributed in little open-air channels within the tradition of an ancestral social organization, is shared out equitably to individual gardens for the cultivation of palms, mainly, with some cereals and fruits as well. The site is also important for migratory birds and includes important archaelogical remains of an original Arab/Muslim architecture of "Ksars" (fortresses) from the 14th century. The fouggara method in use at Ouled Saُd is said to be an outstanding illustration of the Ramsar wise use principle, but because the oasis requires constant human maintenance and is slowly but surely being overtaken by the sand, Algerian authorities have requested at the time of designation that the site be placed on the Montreux Record. Ramsar site no. 1060. Oasis de Tamantit et Sid Ahmed Timmi. 02/02/01; Adrar; 95,700 ha; 2745’N 00015’E. National Heritage Monument. A succession of several oases, each overlooked by an ancient Ksar (fortress) and associated village, with palm cultivation below. Residents practice the traditional method of distribution of water for irrigation by means of "fouggara", a human-made hydraulic system said to have originated in Persia and been introduced to the Maghreb during the Arab conquest of the 7th century. The site is classed as, among others, wetland type Zk(c), probably the first ‘human-made subterranean hydrological system’ in the Ramsar List. The isolation of the site and the hostile environmental conditions have favored the evolution of a very interesting biological diversity. Depletion of groundwater reserves, caused in part by increasing use of modern agricultural pump-irrigation and monoculture, is seen as a potential threat, as is continuous advance of the "ergs" or wind-driven sand dunes. There is some tourism, with pedestrian and camel-back tours of the Ksars and fouggara, and local crafts are in considerable demand. Ramsar site no. 1061. Sebkha d’Oran. 02/02/01; Oran; 56,870 ha; 3522’N 00048’W. A large endorrheic depression of tectonic origin, with a seasonal saline lake and flats characterized by halophilic vegetation. The site surpasses the 1% threshold for pink flamingos and shelduck (Criterion 6). Ramsar site no. 1055.